Course: 80% gravel, 20% road. 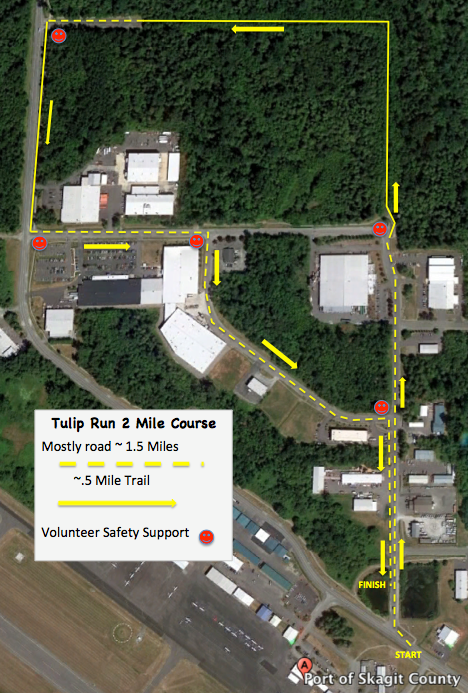 There will be two aid stations on the 10k course, one at 2.5 miles, and the other at 4 miles. T-Shirts may be purchased online in advance and will be held for the participant. Please pre-register if possible. ONLINE REGISTRATION CLOSES AT 1pm APRIL 5TH, 2019. Mail in the entry form (must be postmarked by 3/29/18). Register in person at Skagit Running Company until 1 pm on Friday, April 5th. Awards and Random Prizes: Awards will be given in both races to the top 3 overall (male and female) as well as the top 3 Masters (male and female). 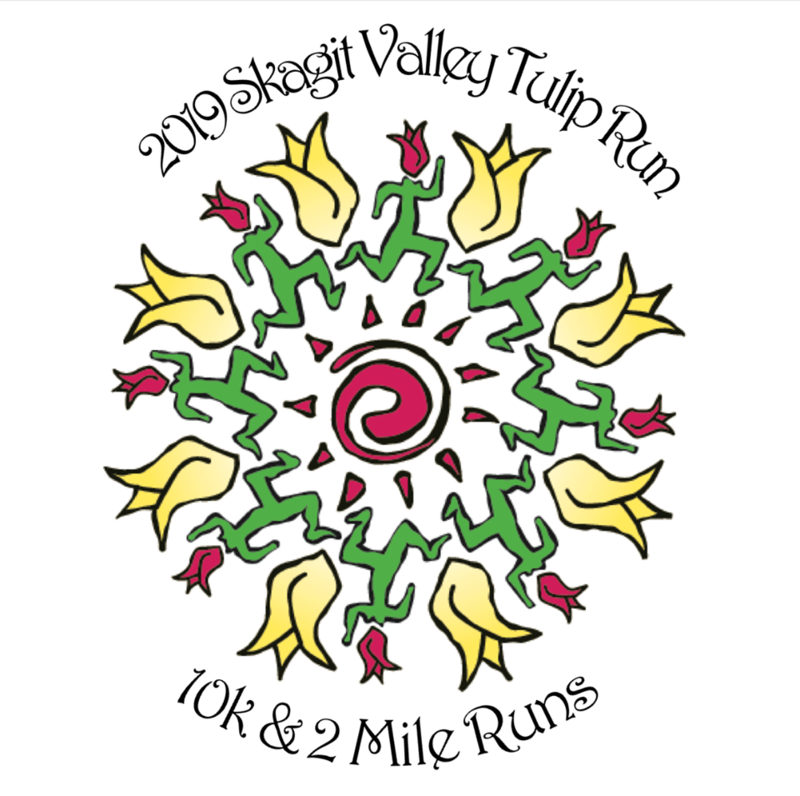 Top 3 in each age division (male and female) will receive a Tulip Run medal. THERE WILL BE NO MAILING OF SHIRTS OR AWARDS. THEY MAY BE PICKED UP AT SKAGIT RUNNING COMPANY (702 S 1st St, Mount Vernon) UP TO ONE MONTH AFTER THE RACE. Directions: Take exit 230 from I-5 north or south. 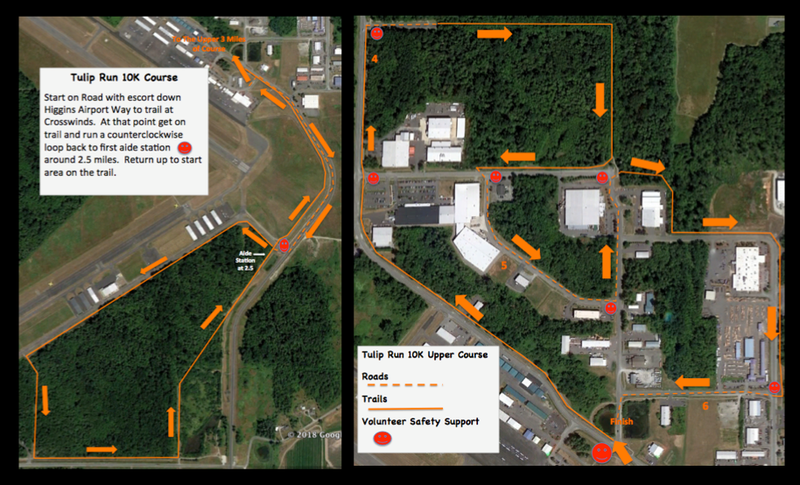 Drive west on State Route 20 to the Port of Skagit sign and take a right onto Higgins Airport Way. Registration is located at Van Zyverden Bulb at 12035 Higgins Airport Way. Arrive early to find parking. Age divisions: 8 & under, 9-10, 11-13, 14-16, 17-19, 20-24, 25-29, 30-34, 35-39, 40-44, 45-49, 50-54, 55-59, 60-64, 65-69, 70-74, 75-79, 80 & over.